*Contact factory for other elastomers. Not for steam applications. The Single Sphere joint/flexible connector provides up to 225 PSI and temperatures up to 230° F*! It protects your pumps and piping system from changes in temperature and pressure, while reducing vibration. An extremely economical and resilient expansion joint/connector, the Single Sphere also helps control pulsation shocks and noise transmission. Its spherical shape reduces the force exerted on pipe lines and equipment. It has a self-cleaning arch and solid plate flanges that are tapped or drilled to mate with 150# or 300# companion flanges. 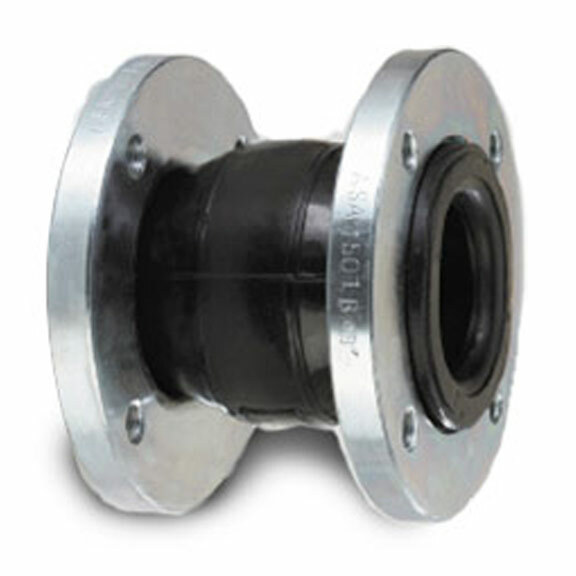 Flanges can be rotated for easy installation and grip the sealing area for an extremely tight connection. Constructed of neoprene and nylon, it has bias-ply tire cord for strength, and is molded into a dense, uniform body. Other materials are also available. Refer to the charts below. EPDM body with 150# drilled flanges provides up to 225 PSI and temperatures up to 230° F*. Neoprene body with 150# drilled flanges provides up to 225 PSI and temperatures up to 230° F*. Butyl body with 150# drilled flanges provides up to 225 PSI and temperatures up to 230° F*. Nitrile body with 150# drilled flanges provides up to 225 PSI and temperatures up to 230° F*.